In 1974, the Arecibo Observatory made history by beaming the most powerful radio message into deep space ever made. The famous Arecibo Message was designed by the AO 74’s staff, led by Frank Drake, and with the help of the astronomer and famed science communicator Carl Sagan. It contained information about the human race and was intended to be our intergalactic calling card. Organizers are seeking innovative ideas from global collaborative efforts … to inspire a new generation of space enthusiasts and define the New Arecibo Message. The NSF-funded facility, which is home to the largest fully operational radar telescope on the planet, will launch its online competition later today on the 44th anniversary of the original Arecibo message. Check out the observatory’s website fafter 1 p.m. for details and today’s Google doodle for more information about the first message. Organizers are seeking innovative ideas from global collaborative efforts of inter-generation, diverse and international teams of students to inspire a new generation of space enthusiasts and define the New Arecibo Message. But this will be no simple task. In order to get started, teams of up to 10 students in grades kindergarten through college, must decode various clues that will be released online. Like a Chinese puzzle box, teams must learn about Space Sciences, break coded messages and solve brain-puzzles to qualify, get instructions, register and then submit their entries. Arecibo will post its first puzzle on its website and social media channels this afternoon (Nov. 16). This challenge gives teams nine months to complete their designs. A winner will be announced during the Arecibo Observatory Week activities planned for 2019, which includes the special celebration of the 45th anniversary of the original Arecibo Message. 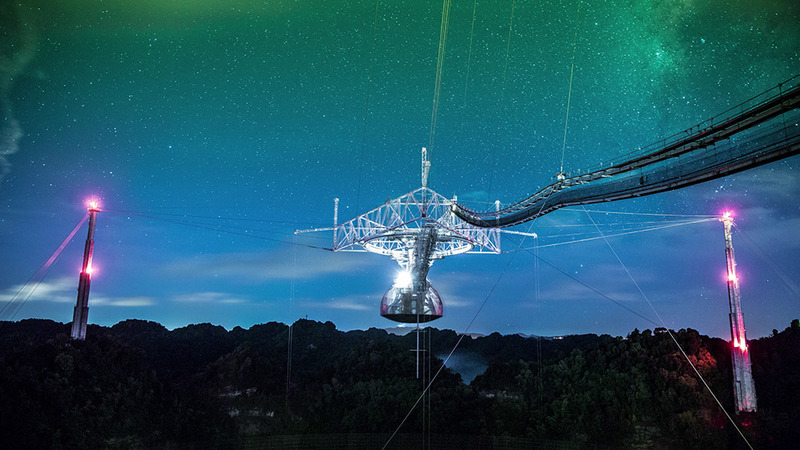 The Arecibo Observatory is operated by the University of Central Florida (UCF) in partnership with Sistema Ana G. Mendez Universidad Metropolitana and Yang Enterprises Inc., under a cooperative agreement with the National Science Foundation (NSF). The planetary radar program is supported by NASA’s Near Earth Object Observation Program.